The Whitehall source went onto suggest that his agenda drove his militant “intervention” into the Birmingham schools last year vis-à-vis the Trojan Hoax plot. Whoever governs the ideas, can shape the public perception of reality. 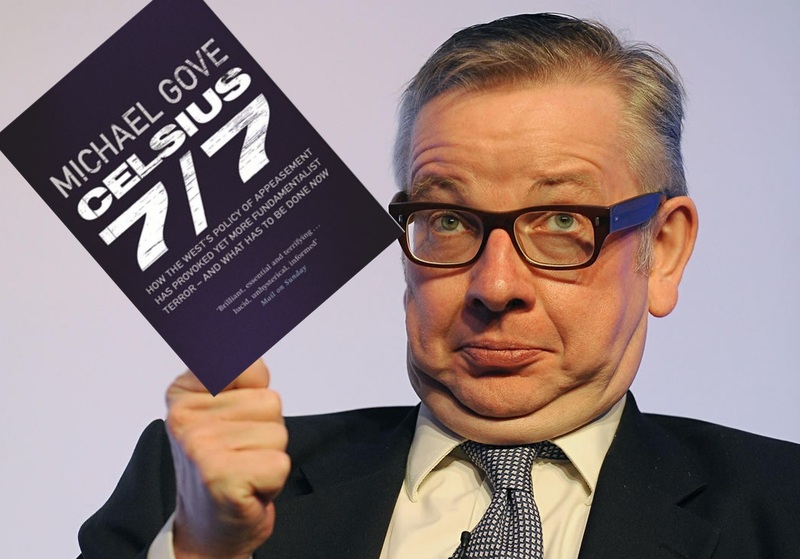 Michael Gove, it seems has been looking for the opportunity he has now been granted. The world in which we are in, is a world, for Gove, “we must remake”. The royal “we” invoked here, is one which primarily revolves around anti-Muslim neocon warmongers and pro-Zionists known to whitewash Zionist crimes. William Dalrymple’s devastating comments on this exact point have been noted in the first part of this series. This line of argument has also been dealt with in some depth previously in an article critiquing Tony Blair’s essay, in which he, like Gove posits ideology as the driving force of today’s violence. In reality, traditional Islamic scholars have written voluminous works about the history and causes of the fall of the Ottoman Empire and other devastating incidents in Islamic history. The Mongol hoards and the sacking of Baghdad, brought the Islamic world to the brink of destruction. Often, far from questioning the Qur’an, the causes have been derived from it. Be it success or humiliation, it has been the decree of God and the state of the people which has determined the situation they are in. If anything Gove’s understanding highlights the isolationist, not to mention supremacist viewpoint of Gove, who frames the entire discussion into an “us” and them” construct where the “success of the West” challenged the “superiority of the Islamic faith”. Indeed, it is this ethnocentric outlook which governs his “remade” world. “Islamism” is never given a precise definition in his book. Ambiguity and obfuscation is, of course, a staple neocon tactic which allows neocons like Gove equivocate. Amongst his embellishments however, he explicitly notes the “restored Caliphate” as something “Islamists” believe in. The establishment of a just Islamic Caliphate concordant to the conditions of Islamic law is an integral part of Islam. Similarly, lumped together with other examples of “Islamism” is the “prosecution of Jihad”. Jihad, as self-defence or a means of removing injustice through arms is, again, Islamically founded. Its conditions, requirements and virtues are articulated in disparate Islamic sources from the primary legislative texts to the thousands of statements of the many distinct scholars of Islam. From an Islamic perspective, there is nothing abnormal, or specific to the three figures he has named here. Indeed, the Islamic scholars have discussed the abovementioned qualities in the context of tasawuf, or Sufism, the adherents of whom Gove so lovingly posits as the “mainstream”. They too believe that every act of a Muslim should “weighted by the Shari’ah”. To reject the belief in the governance of Shari’ah, which comprises guidance found in the Qur’an and Sunnah would constitute a rejection of parts of the aforementioned primary texts. However, this is what Gove regards as “Islamism”, which is “at odds with the values of the liberal West”, and which therefore requires “tackling at the root”. In other words, situated before the three prongs of “Islamist” ideologues, is a directed attack on the religion of Islam itself. One of course wonders whether he would state the same about the Board of Deputies of Jews, which has lobbied the government to prevent scrutiny of the Beth Din’s “inequality”. Khurshid Ahmed belonged to the PREVENT-supporting British Muslim Forum. Haras Rafiq unsurprisingly, is a lying neocon policy-peddler, and an employee of Quilliam Foundation, whose director, Maajid Nawaz frequently calls for a reformation and promotes anti-Islam hate-preacher Ayaan Hirsi Ali. Given the above, it should come as no surprise then that Gove fully endorses Hirsi Ali, who recently, in-line with Gove’s conception of Islam, called upon Muslims to disregard of verses of the Qur’an. Hirsi Ali has a history of fraud, fabrications, defending far-right terrorist Anders Breivik (who cited her work in his terrorist plans), and believes the racist Benjamin Netanyahu deserves a Nobel Peace prize. She has also in the past described Islam (not “Islamism”) as a “destructive, nihilistic cult of death” that should be “crushed”. In an updated version of Gove’s book, he describes Hirsi Ali as, “the brave Netherlands parliamentarian who has done so much to alert her fellow Dutch citizens to the dangers of Islamism”. The conception of the ideal Muslim is the one who toes Gove’s neocon government policy, and effectively does not believe in his or her faith. He is, in this regard, no different to the “reformed” Muslim envisaged by the hate-filled neocon Hirsi Ali. In his fanatical attempt at creating the ideal enemy in the communist mould, Gove drags most Muslims into his definition of “Islamism”. This creation of an ideological enemy is needed for neocons to instil fear and to unite the people against a common foe. To fully understand the danger of this Machiavellian mechanism, in the next part we will look at Gove’s foreign, and then domestic, policies from the perspective of neoconservatism. This entry was tagged Abul ala Maududi, Ayaan Hirsi Ali, Beth Din, caliphate, David Fromkin, foreign policy, Guantanamo Bay, Haras Rafiq, Hassan al-Banna, ideology, Irving Kristol, Islam, Islamism, Jihad, Khurshid Ahmed, Maajid Nawaz, MCB, Michael Gove, Michael Gove Justice Secretary, Middle East, neoconservatism, Ottoman Empire, palestine, Quran, Sayyid Qutb, Shari'ah, Sharia, Trojan Hoax, Trojan Horse, war on terror, William Dalrymple. Bookmark the permalink.